After starting the Player Comparison series with the two best players in the world, how do you follow that? In terms of quality of player, you can’t (unless I had the Pele/Maradonna stats handy). But the idea behind this series was to not only look at two comparable players based on stats, but also to help settle pub debates. And so with that in mind, and from a Premier League starting point the contenders choose themselves. Fewer players have been at the heart of debates and comparisons, both for rival club fans, but also for England fans. In the Red corner, we have Liverpool’s home grown King of the Kop, Stevie G. Gerrard has been strutting his stuff at Anfield since 1998, and for the national team since 2000. In the Blue corner, we have his Southern counterpart, JT’s BFF, Frank Lampard. Whilst Gerrard has only known life at a big club, Lampard began his football education at West Ham’s prolific youth academy. Under the tutelage of Tony Carr and then Uncle Harry, young Frank made his debut in the 1995-96 season (first on loan at Swansea) before eventually moving on to current club Chelsea in the summer of 2001 for what at the time seemed an excessive £11m but in hindsight, was something of a bargain. He made his England debut in 1999. Lampard is 2 years older than his Mersey rival and has been on fans radars that bit longer. Having always been an attacking central midfielder, he perhaps had a head start on Gerrard in terms of goals scoring. Those of you who can remember far enough, will recall that Gerrard initially broke into the England team as the deeper lying defensive midfielder next to the attacking Paul Scholes. It appeared as though Lampard was being groomed to play the attacking role from the middle, whilst Scholes was pushed out left. However, by this point Gerrard had started to display his attacking instincts, rather than being the holding player he first appeared. The result being a headache for their national coach for the best part of a decade. Gerrard’s been pushed forward, Lampard back, Gerrard wide, and Lampard as part of a diamond. Yet still, England have never really performed with the two players in tandem. National team aside, there’s also been their club form, with both known throughout the World as two of the best goal scoring midfielders in football. Add to that a bit of bad blood between the clubs and Gerrard’s aborted move to Chelsea, and you have a debate on your hands. Who is or was better? As with the Messi vs Ronaldo comparison, I’ll be comparing their league form as there are no rankings applied to the Champions League. The comparison will begin from the 2001-02 season when Lampard began his Chelsea career. I’ll also review their international goals as well. Unlike the Ronaldo v Messi comparison, this will be based on final league positions. And so onto the Stats. At first glance, and much to my surprise, there’s actually no comparison at all. In the ten and a half seasons since Lampard joined Chelsea, he’s scored 123 league goals in 362 games to Gerrard’s 78 in 320. That’s a rate of 0.34 per game compared to 0.24 or on the other hand, a goal every 3 games for Lampard aginst one every 4 games for Gerrard. Case closed. All Hail Frank Lampard – king of the goalscoring midfielders. He’s got more goals, more assists, and more against the Top 6 with a very impressive 24 goals compared to Gerrard’s 14. And he can be relied on to play more games each season. Gerrard only comes out on top in terms of Average Opposition. On average, across the 10 and a half season, his goals are against 11.82 ranked opponents, compared to Lampards 12.39. Well, that didn’t take long at all, I should probably start on the Henry vs van Nistelrooy comparison. But wait. Scratch a little under the surface and things are indeed a little closer, and worth a comparison. Since Zola left Chelsea at the end of the 2002-03 season, Lampard has been taking his teams penalties, and he’s scored 33 of them. Take the penalties out and he’s on 90 goals. In that same time, Gerrard has scored 12 penalties, taking his goal tally down to 66. Now 90 vs 66 is still a decent gap, but if we took Gerrard’s goalscoring rate and applied it to 362 appearances, he’d be on for 75 goals. Lampard is still on top, but once you take away the penalties, the goals per game is now just 0.25 to 0.21. Gerrard is still doing it against better opposition as well – his Average Opposition Index is 12.29 compared to Lampard’s 12.80. The most telling numbers though are in the goals against Top 6 Opposition. With penalties removed, Lampard loses almost half of his goals against the top ranked opponents. It’s now only 11 goals vs Gerrard’s 10 goals – and this is essentially in a season more of appearances – 42 extra. So from a big game player point of view, the stats are now leaning towards Gerrard. What must also be taken into account is the teams that they play in. Since 2001, Chelsea have won the title 3 times and finished 2nd a further 4 times. Their average position over the 10 full seasons is 2nd. In the same period, Liverpool have finished 2nd twice, but more tellingly, have finished outside the Champions League Top 4 spots in four seasons. Their average position is 4th. Even the most die hard Liverpool fan would have to admit that Chelsea have consistently had better players. Goal scoring opportunities, and indeed assists are largely dependent on team mates. Looking at the above graph, both players best goalscoring seasons have coincided with the team’s highest finish. In 2008-09, Gerrard scored 16 league goals (12 after penalties) in the season that they’ve come closest to winning the Premier League, finishing the season on 86 points. Lampard meanwhile scored an incredible 22 goals in 2009-10 (13 after penalties) to end Manchester United’s 3 year spell of dominance. This would suggest each player’s goals were significant to the club’s final positions. It’s not an exact science, but if you take out the goals scored by each player, Chelsea would be worse of by an average of 3.5 points per season, whereas Gerrard’s equivalent contribution is 3.6. Nothing in it. But what about the percentage of the overall team points – to allow for the quality of the teams. Well once again, it’s very close. Lampard’s goals are directly responsible for 4.33% per season of Chelsea’s points over the last 10 seasons. Gerrard’s goals are worth 5.33% of Liverpool’s total points per season. On this measure, Gerrard is more important to his team. 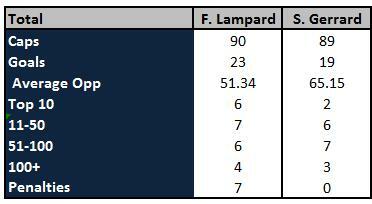 For the record, with penalties, Lampard’s percentage increases to 7.33% compared to Gerrard’s 6.02%. With this in mind, what’s the average order of their goals? We know that the first goal is always the most important for a team, whilst the second can often prove decisive. For Chelsea, for both his 123 league goals, and the 90 from open play, Lampard on average, scores Chelsea’s 2.1 goal. In the same period, Gerrard’s 78 league goals have come as Liverpool’s 1.9 goal, compared to 1.8 after penalties are removed. So all in all, looking at all of the stats based on their goalscoring, the average and range of the opponent, and the importance to their teams, there’s very little to choose between them. Lampard has more goals, Gerrard has a better opponent per goal. Lampard has more assists, but Gerrard is more important to his team. I hate to sit on the fence, and generally dislike to do so, but there’s nothing in it. But what of their contributions to the national team. After all, the biggest talking point around the players is why can’t they play together? Well as we’ve seen above, they’re just too similar. Sir Alf Ramsey famously didn’t choose the best players in every position to win the World Cup back in 66. He played the players that gave the best balance – a balance that’s missing when they’ve played together in the middle. We know that Gerrard is likely to be pushed further forward or even out wide if both players make the starting line up in the upcoming European Championships, but who deserves the attacking central midfield slot? I’m afraid it’s not much clearer at International level either. They’ve both played pretty much the same amount of games for England, and in that time, Lampard leads the goal count with 23 to 19. However, once penalties are removed, Gerrard has actually scored 19 to Lampard’s 16. Both have scored against good opposition – Gerrard’s first goal was in the 5-1 win away at Germany in the 2002 World Cup qualifying game. Lampard can count goals against number 1 ranked France (Euro 2004) and Spain in his tally. Of their goals, 7 of Lampard’s have been in friendlies, compared to Gerrard’s 5. The average opposition index leans in Lampard’s favour by 14 places, which would suggest he is the bigger game player for England. Indeed, he was voted England’s player of the year after his 3 goal haul in Euro 2004. The Elephant in the room though is the World Cup. Gerrard has scored 3 goals in the two World Cup’s he’s played in whereas Lampard has received criticism (particularly in 2006) for failing to do so, despite many many shots. He can count himself unlucky that his excellent chip against Germany in the last World Cup was incorrectly disallowed. So looking at the Internationl records, we’re still in the dark. 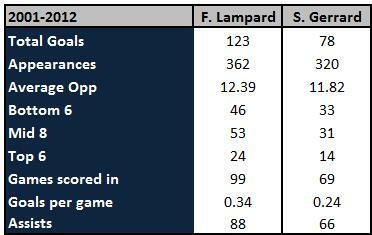 Lampard has the better Average Opposition, but more goals are in Friendlies, and he takes the penalties. He did have a great European Championships, but Gerrard has scored in 2 World Cups, and has more goals in open play – despite starting off in the holding role. In terms of who’s the better player for the big games, I’m afraid it’s just too close to call. Both players have scored in Champions League finals. Both have scored decisive goals in FA Cup finals. Gerrard has also scored in the League Final and the UEFA Cup Final, whilst Lampard has scored the goals to win Chelsea the title. Both have scored 4 league goals vs perennial title winners Manchester United. Both are big game players. Lampard has 22 European Goals in 89 games (including 4 with West Ham), Gerrard has 38 in 116. Gerrard is more important to his team, whereas Lampard does it more consistantly, albeit against slightly lower opposition. Looking strictly at the stats, it’s impossible to call this one, and despite hating sitting on the fence, this one will have to be left up to each reader’s interpretation. What can be agreed on by all, is that they are both outstanding players, and will go down as two of the Premier League and indeed European Football’s best goalscoring midfielders. Any comparisons you’d like to see, please let me know. Once Gerrard starts crossing for Carroll, and taking long-distance shots from his knock-downs, expect his goals and assists figures to rise considerably.. It might be something that clicks before the end of the season, and could lead into something next year, but at the moment, Carroll isn’t first choice. I agree with you about the knock downs though, Gerrard used to get off a good few shots from Crouch’s knock downs – like his first goal in the 2006 FA Cup final. Ha ha, not for Liverpool, but West Ham look likely to gain! After I wrote that comment he did start to show an improvement to be fair – scoring in the FA Cup Final as well as at the Euros. But wheres the facts on defencive work and up and down pitch work. gerrard is a tank and can defend and attack aspose to lamps only being able to attack. Yes, that’s a valid point about defensive work, though unfortunately I didn’t have the information available going back those seasons. I think to be fair to Lampard, he does cover a good bit of ground and early on was known for his stamina in being a box to box midfielder. Steven gerrard his better than frank lampad. zidane said gerrard is the best footballer in the world in 2009.. it just that lampard play with better team n teammate n gerrard is not.. remember during 2005 champion league, he uplift all of liverpool player spirit n will n lead them to glory..
Frank Lampard is the best midfielder in the world. Come on CHELSEA. Hi Zvonksy, there’s a number of reasons – mainly that the person taking the penalty is more than likely going to score – just because Chelsea have won more penalties than Liverpool in the above stats, doesn’t mean that Lampard is better goal scoring midfielder than Gerrard. Secondly, you could take the example of Andy Johnson at Palace when I think half of his 21 league goals were penalties that season – I think it’s flattering. And just on your point below, Gerrard hasn’t always been Liverpool’s first choice penalty taker – think Xabi Alonso in the 2005 Champions League Final as a quick example. I don’t doubt the importance of penalties, but they’re definitely easier to score than doing so from open play or a free kick. There is no doubt penalties are easier to score then goals in open play but they should not be discounted. Even taking his penalties away he has more goals be it in more games of course but if Liverpool’s form over the last 2 years is much to go by he will be forever as Gerrard is pretty much finished. So it most definitely means Lampard is a better scoring midfielder. I’m a Arsenal fan as well so this isn’t even a biased Chelsea fans point of view, it’s simply my opinion and I have no doubt Lampard is better. Fair enough, I don’t support either so don’t really have a preference either, but I do think penalties should be adjusted for – Lampard has scored a lot more and that is an unfair advantage when comparing goals. As an arsenal fan, if you go to the player comparison link at the top, there’s a couple more bits that may Interest you – Henry vs van Nistelrooy, Henry vs van Persie and Arsenal invincibles vs Juventus invincibles. did you just say it is easier to score in penalties ? come on, the whole crowd are watching you. there is a ball at a hall for you to play. the pressure is very high. if you think its that easy, then the reigning world best player wouldn’t have missed his penalty against chelsea. he is an attacking player too. and also roberto baggio, at the time when he was world best player, but yet missed his penalty. this tells you penalty taking isn’t easy. Hi Awal, unless they’d taken the same number of penalties, I don’t think it’s a fair comparison. The whole crowd are watching at all times! Have mentioned my thoughts on penalties in the earlier comments, but the stats are open to each persons interpretation. For me, players of that quality should score the majority of their penalties with ease. Lampard’s stats are clearly better, but somehow you’ve managed to make this a close call? Also, I have no idea why penalities shouldn’t count all of a sudden. They’re perfectly good goals and being a good penalty taker isn’t easy as it often involves huge pressure. 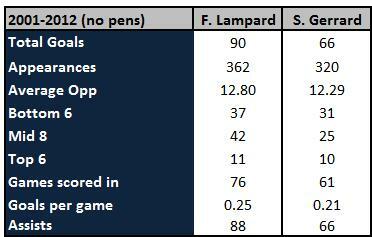 I simply don’t see why Lampard should be punished for being a much more consistent penalty taker than Gerrard. I mean, the reason Alonso was Liverpool’s penalty taker a few years ago was because Gerrard kept missing them. Moreover, you should look into how they perform in Chelsea v Liverpool games. I reckon Lampard has scored about 10 or 12 goals against Liverpool whereas Gerrard has only scored once against Chelsea, in a 4-1 defeat at Anfield. That about sums it up. Also, Lampard was named Player of the decade in the Premier League. That’s pretty hard to beat. CaryGrant, we’ll have to disagree on that one. If you take Mark Noble for West Ham as an example, all but one of his last 13 goals have been penalties. If I took another midfielder who scored say 10 goals from open play in the same time, would you say that Mark Noble is a better goalscoring midfielder? I’ve left the stats in with and without penalties, so I guess it’s down to preference. In my opinion, penalties are an unfair advantage, but each to their own. If you’re saying that penalties are unfair because it’s easy, then I disagree. Penalties are a lot harder to score than in open play. All the pressure and expectation is on that player, from his teammates, manager and thousands of fans. Not to mention opposition fans. Everything stops for that moment. It’s different just watching it than actually doing it. Penalties are also not a certainty of scoring, no matter who the player is. Certain players just become prolific in taking them. Hi Bran, thanks for the comments. With regards to penalties, we’ll have to agree to disagree. I think there’s more pressure on say a one on one situation than a penalty. Players with the technique and ability of the two above should really be scoring 9 times out of ten from the penalty spot. I didn’t mean to underplay the importance of penalties, but when comparing the goals of the two players, by removing the penalties from the comparison, it made things more of a level playing field as Lampard has taken a lot more penalties than Gerrard. I feel Gerrard has been more skillful on the ball. But if recent form is considered, Lampard has the edge. Maybe Liverpool’s poor outings has had an impact on Gerrard’s recent performances. Just got to say that these stats were taken between 2001 and 2011 Gerrard was only starting his career when Lampard was at his peak in 2001! These statistics don’t show which player is better as it doesn’t include tackles etc. It only shows an attacking players statistics (the question is who is the better player not attacking midfielder) ……..Gerrard has also played 42 games less than Lampard in these statistics. Gerrard has also proved to be a better leader and a more versatile player then Lampard who’s main job is to score and set up goals in his attacking free role. Gerrard is the captain of England which is clear evidence he is a better leader and Gerrard still plays week in week out as Lampard is sat on the bench in recent times…What the statistics don’t show is the amount of tackles made and penalties won…The question is ”who is the better player?”. Clearly Steven Gerrard is a better player he is a goalscorer, creates goals , scores vital goals (Olympiacos, AC milan, West Ham, Man United etc.) ….I can’t believe this is even a question , GERRARD IS A LOT BETTER!! Gerrard was only two years younger in 2001, neither were in their prime. Your whole biased comment is invalid. Lampard also provided two killer passes that turned into goals against Barca recently, one of which came from robbing Messi of ball. Had that been Gerrard, he would have lunged into Messi and got sent off, typical Gerrard. One of the reasons why Lampard has played more games than Gerrard is because he held the record for most consecutive games played in the league, until it was recently broken by Friedel. But an outfield player holding that record is more impressive than a GK doing it. Captain of England? Is that even an honour these days? Capello didn’t appoint Gerrard for obvious reasons yet Hodgson did. Hmm, who would you trust, a world renowned manager with the highest honours to prove his status,or the former west bromwich albion boss? Tough decisions, eh? They are also both playing deeper roles recently and Lampard has clearly excelled better. Want a little bit of proof? Just watch the FA Cup final. Also, when Stevie Me scores 22 goals and makes 17 assists from midfield in a league season alone, then maybe we can have a discussion. Still not convinced? Maybe the voters of the Ballon D’Or in 2005 will convince you. Had it not been for some magic from Ronaldinho that year, we all know who would have won. Clearly Lampard is a better player he is a better goalscorer, creates more goals, scores more vital goals against better opposition. I can’t believe this is even a question, LAMPARD IS ALOT BETTER!!! Good comparison article. One thing though, look up the ratio shooting chances/shot’s that are anywhere near dangerous. I think you would be suprised. Lampard wastes a huge amount of chances because attempts from everywhere on the pitch. ”both players best goalscoring seasons have coincided with the team’s highest finish.” Then judging by how far better chelsea have been, this makes the stats a tad tinted? The fact gerrards stats come even close is a testament to the fact he is better. It is no cliche that he single handedly dragged LFC to 4th~ for a number of seasons. You only have to youtube the goals scored by them to compare the stark difference, heck most of lampards were deflections!. More importantly, as the article points out, lamps is always attacking, whereas gerrard has been on the right wing, left wing, deep lying defensive for a number of years. So it should be a foregone conclusion. ‘heck most of lampards were deflections!’ No, they’re not. There is a youtube video of all goals scored by Lampard and none were deflections. It’s a very common mistake alot of people make when they themselves haven’t viewed the proof. In gerrard’s best season, he had Alonso and Mascherano behind him and Torres infront him. He didn’t ‘drag’ liverpool. Gerrard has never played as a DM, he’s played next to a DM as a box to box player but he got sent off most of the time or was just ineffective. He played right wing or SS to Torres because Benitez knew all he could do was attack like a wild blind horse and that he’s a clumsy player to have a deeper role. He’s been playing that deeper box to box role recently but it has not worked out, Lampard has been playing in that role too, and he’s been more effective, notching up two assists against Barca, and one in the FA cup final, while outclassing gerrard. And if gerrard is this super human footballer that ‘dragged’ liverpool to 2nd and 4th a couple of times all by himself according to you, then what has happened since 2009? No, what he actually said was that gerrard had been one of the better players in the 2008-2009 season. So in a way, you’re right, you can’t argue with a non existent quote. you’ve forgotten one vital thing. Lampard was runner up as world best player before. a level Gerrard hasn’t reached !!! Maybe you should compare trophies won? This is what Zidane actually said: “Is he the best in the world? He might not get the attention of [Lionel] Messi and Ronaldo but, yes, I think he just might be,” Zidane said. “If you don’t have a player like Steven Gerrard, who is the engine room, it can affect the whole team. “When we were winning league titles and European Cups at Real, I always said Claude Makelele was our most important player. There is no way myself, [Luis] Figo or Raúl would have been able to do what we did without Claude and the same goes for Liverpool and Gerrard. Zidane has won numerous personal awards as well as club awards and he was part of the famous Galacticos, it doesnt matter how Lampard scored the goals…. a goals a goal! Steven gerrard is better than frank lampad. One quick observation,being versatile doesn't make you a better player,it actually suggests that u are unable to master a position,Milner can play 6 or 7 positions but he'll never be world class..Rooney has missed 5 of his last 6 penalties-proof that penalties are not half as easy as they look..And all this talk of Stevie-who I think is a splendid footballer-being able to do more for Chelsea than Lamps if he had moved is hogwash..You don't become the first player in any position to score 10 or more goals for 10 consecutive Premier League seasons by mistake.you just don't! !And here's one more thing to ponder Lamps has played moRe penalties than StevieG,yet Stevie has missed more. Trophies don't make players better, they come from playing in better teams. Gerrard is the best all round player this country has produced since Bryan Robson (and possibly before). He attacks better than Scholes and defends better than Keane and his leadership and inspiration are the best ever seen in football - just look at Istanbul 2005 CL Final and 2006 FA Cup final. Would Scholes or Lampard have done the same things with the average Liverpool team he worked with? Man Utd won the 1999 Champions League final WITHOUT Scholes and Keane didn't they?? Not exactly integral were they? They just played in good teams! And as for Lampard... A very selfish, albeit good goal scorer, didn't offer too much else and probably, alongside Scholes, is the worst defending centre midfielder I have ever seen! I have never seen a better all round, box to box, consistent player than Gerrard who ALWAYS rises to the big occasions! !